This was inspired by a twitter comment that Clotilde from Chocolate & Zuccini recently. The French, like the Italians, have a history of creating and eating candied fruits in a way that the Brits seems to have missed. Yes, we have glacé cherries and chopped mixed peel but that is about it. In France in the run up to Christmas you will find platters of individually candied fruits - figs, mandarin oranges, melons, pears and pineapple as well as chestnuts, greengage plums, peaches, apricots and clementines. Beautifully presented, glowing translucent fruits. The link Clotilde gave is to a company called La Fabrique de Douceur here. Their chillies, along with the other fresh fruits they make are lucious and beautiful to look at but I think they are only available in France. Reading through their website reminded me that I have quite a few chillies at home which I can't eat due to allergies. Rather than simply throw them away I thought I would have a go at candying them, just to see what would happen. So here is a simplified version of candied chillies. 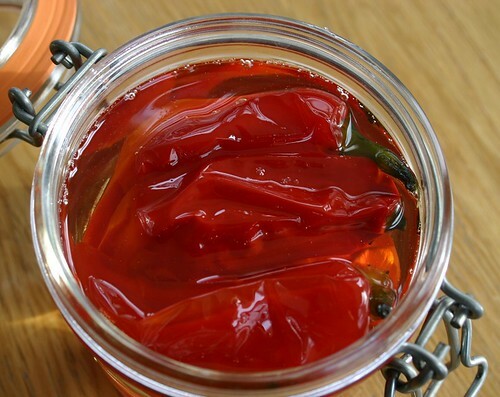 The sweet and spicy syrup would make a delicious drizzle over ice cream or a fruity tart, whilst the chillies themselves could be used in biscuits or ice cream, or served as they come with cheese. As you can see this quick version gives you the flavour but not the texture of french-style candied fruit. These are very quick and easy to prepare and if you have any chilli-heads as friends, they would make great easy foodie presents too. pour about 1L freshly boiled water into pan and add the chillies. bring the pan to the boil and blanch the chillies for 1 minute. drain the chillies and refresh in cold water. add the chillies and cook at a gently boil for 30-40 minutes. during this cooking, sterilise the jar in the oven or in boiling water for 15 minutes. allow the jar to cool before storing in the fridge. To be honest, I don't know how long these will last after cooking, but since the chillies are blanched and so sweet, I am sure that 2-3 months is quite reasonable as long as they are completely submerged in the sugar syrup. I have a couple of ideas for recipes to use these in which I will add in the near future. Enjoy! THAT looks delicious.. I have a severe chilli addiction and I can't wait to try this recipe... thanks, Kate! These do look good. I did make some chilli vodka one year - sugar, vodka and chillies. Too strong to drink on it's own, but I add a spoon or two to other drinks such as sloe gin - just enough to give a slight kick but by no means overpowering. that looks really, really fantastic, i being Pakistani and definitely a chili-head.